The Prokart Raceland in Wackersdorf welcomed the participants of the German Kart Championship to the second event of the year last weekend. The fields were strongly manned again with 179 drivers and impressed with balanced races. In the evening there were eight winners in eight races. The weather caused some additional excitement. Four weeks after the season kick-off of the four DMSB grade series German Kart Championship, German Junior Kart Championship, German Shifterkart Championship and the DMSB Shifterkart Cup in Lonato (Italy), the highest German kart racing series was back in Germany. Location of the Int. ACV kart race was the 1.190m long Prokart Raceland in Wackersdorf (Upper Palatine). The most modern kart track in Germany was the perfect location for the ranked races three and four. The weather was the only inconsistency. Next to lots of sunshine there were also heavy rains that jumbled the championships temporarily. The races were very balanced with eight winners in eight races. Before the half-time event in Ampfing Harry Thompson (DKM), Kai Askey (DJKM), Jorrit Pex (DSKM) and Emilien Denner (DKSC) are leading the lists of rankings. The best scenes from Wackersdorf are going to be summed up again in a DKM-magazine and can be viewed on May 27th at 3:30pm on the German automobile-, engine- and motorsports-channel. Additionally lots of information and highlights await on the official DKM Instagram account www.instgram.com/deutschekartmeisterschaft as well as at www.kart-dm.de. Frenchman Emilien Denner (CRG Holland) tied in seamlessly with his performance in Lonato at the DMSB Shifterkart Cup and immediately secured pole position at qualifying. But it already became clear during the following heats that things wouldn’t be just as easy for him this time. He only ended up on third place of the interim rankings behind Alessio Curto (Valier Motorsport) and Luka Kamali (TB Racing Team). During the first final race he fought his way forward again though and defended his top position against Curto. He was accordingly content at the finish line: “This wasn’t an easy race for me. Alessio kept really close the entire time. I tried to stay focused and am happy to have won.” Just like second winner Curto, Franz Lehner (BirelART Racing KSW) experienced a calm race and took third place on the winners‘podium. Behind the two, Davids Trefilovs (SRP Racing Team) and Tobias Mähler (Kartshop Ampfing) completed the cup ranks. From pole position, Denner also won the start into the second race. He wasn’t able to drive off this time though and got under pressure due to his pursuers. Marvin Langenbacher (RS Motorsport) drove past him and led the field consisting of 34 drivers. Denner was involved in a collision in the meantime and had to end the race prematurely a couple of laps later. There were more changes at the top as well though. Curto fought his way forward and celebrated the victory: “I already won here last year and am happy to repeat the success. Contrary to the competition I only had two new tires, which was especially difficult in the beginning.” Tobias Mähler (Kartshop Ampfing) ended up among the top five again in front of Pawel Myszkier (Mach1 Motorsport). After a difficult first race, the Pole drove forward to third place. In a thrilling finish, Lehner fought his way past Filip Ugran (R&R Racing Team) and achieved fourth place in the end. Reigning six-time champion Jorrit Pex (CRG Holland) was in his element on Saturday. After a strong qualifying and pole position, he used his starting position in the heats as well and defended it. Next to him was his brother Stan who won the start into the first final race on Sunday. He then won this with a clean performance. “I had a perfect start and immediately took first place. We only used two new tires, which can be an advantage for the next race. We put a lot of effort into the development of our engines throughout the last few weeks, which is now paying off”, the Dutchman summed up in his winner’s interview. Behind Pex, Rick Dreezen (BirelART Racing KSW) worked his way forward to second place and already had a small advance at half-time. But towards the end of the race Fabian Federer (SRP Racing Team) and Jorrit Pex came close again – the two CRG drivers didn’t get a chance to attack anymore though. Marijn Kremers (BirelART Racing KSW) came in on the secure fifth place. Best German driver was Alexander Schmitz on seventh place. The shifterkart drivers experienced a déjà vu during the second race. The race started on the dry track but after only a few laps it started to rain and the race was paused. Just like at the kick-off in Lonato the rain stopped again though and the field divided itself into two groups – those with rain tires and those without. In the beginning the drivers with the molded tires fought a narrow fight at the front, but the slick drivers got faster and faster and raced forward from behind. Benjamin Tornqvist-Persson (CRG Holland) was at the front in the end and got a little emotional: “I lost the World Cup title here last year due to a small mistake. It’s so good to win now on the same track. The race wasn’t easy, but the slicks were the right choice.” Behind him followed German drivers Toni Tschentscher (SRP Racing Team) and André Matisic (Solgat Motorsport). Fourth winner Brandon Nilsson (Gold by Brandon Racing) used the speed of the slick tires as well, but a spoiler penalty threw him back to ninth place. Therefore Stan Pex (CRG Holland) was fourth winner and the best driver with rain tires. Fifth place went to his brand colleague Federer. Josef Knopp (TB Racing Team) caused a surprise at the juniors‘ qualifying. The Czech drove the best time but fell back to twelfth place during the heats. New best driver was Thomas Ten Brinke (Ricky Flynn Motorsport) from the Netherlands. The final races of the youngsters were familiarly turbulent. After an exciting starting phase, Sebastian Ogaard (TK Racing) ended up as the winner. The Dane profited from the tough fights his opponents fought during the first third of the race and drove off considerably. “This is a mother’s day present. I know mine is at home and holding her thumbs for me. I didn’t expect to win, which makes it even better”, he rejoiced at the finish line. The fight for the following places was much narrower – up to four drivers fought thrilling duels. Ben Dörr (TB Racing Team) kept the upper hand and came in second after 17 laps. Third place went to Maxim Haralampiev (Maxim Racing Sport) in front of Luca Leistra (KMS Europe KFT) and Thomas Ten Brinke. The second final of the juniors was eventful. Several collisions during the starting phase caused a break in the race and a postponing of the start. “We’ve decided that the girls and boys need to calm down and are postponing the race to the end of the day”, explained race director Thomas Lainer. At the third and final start, the young drivers stayed calm then and fought fair duels on the now wet track. 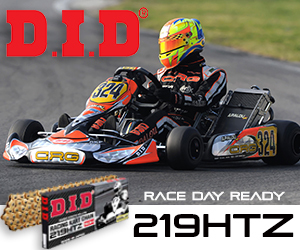 Form first starting row, Edoardo Ludovico Villa (Tbkart Srl) led the field consistently. During the first half of the race he was put under pressure by kick-off winner Ogaard, but the Dane lost contact and was then busy to fend off his pursuers. Until crossing the finish line he was passed by Dörr and Jak Crawford (Komsic Racing Department). Jule Weimann (Solgat Motorsport) showed a strong race as well: She was rewarded for her success with a cup by coming in fifth. Overall leader Kai Askey (Ricky Flynn Motorsport) experienced a difficult weekend in the meantime. Due to a falling out during the first race he had to start into the second final from the last starting row, fought his way forward again to seventh place though and thereby collected important championship points. The second final race could easily have been a Hollywood blockbuster. Alexander Tauscher led the field after a strong beginning and seemed to be on a safe way to his first DKM victory. After a less than perfect start, Thompson came back though and fought his way past the leading driver. Technology then stopped the Brit a little later and he had to end the race two laps prematurely. Therefore Tauscher was able to freely drive towards his first triumph in the top class of German kart racing: “I can hardly believe it. If you think about the fact that I started into the first final race from 32nd position and now won the second – it’s a great story. I’d like to thank my team for the competitive material.” Haverkort came in second this time in front of Andrea Rosso (CRG Holland). The Italian fought his way past Sasse in the end and stood on the podium. The top five were completed by Zane Maloney (Ricky Flynn Motorsport). 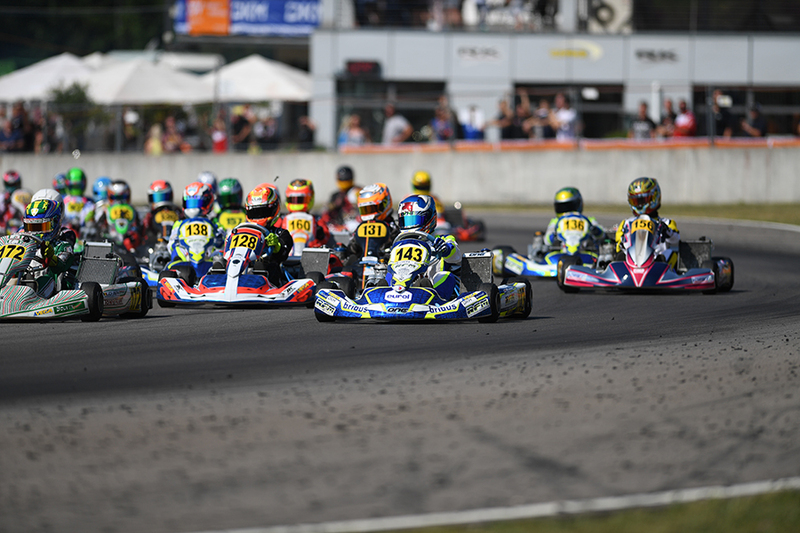 The German Kart Championship is going to continue in three weeks on the Schweppermannring in Ampfing. The race is simultaneously seen as the final rehearsal for the Kart Grand Prix of Germany that is going to take place two weeks later.